Members of the Senate Democratic Caucus, concerned over the low number of residents eligible to vote who have no photo indentification to do so have asked Secretary of State Nandita Berry to work on making mobile ID units more available between now and November. Texas Senate Democrats want Secretary of State Nandita Berry to work on making more mobile voter ID units available between now and November to ease fears that many eligible voters don't have the photo IDs the law requires. "We are especially concerned that registered voters who lack the appropriate identification documents will be prohibited from voting this November," said the letter, signed by caucus Chairman Sen. Kirk Watson and nine other senators: John Whitmire, Rodney Ellis, Carlos Uresti, Judith Zaffirini, Eddie Lucio Jr., Royce West, Juan "Chuy" Hinojosa, Sylvia Garcia and Jose Rodriguez. Berry's office did not immediately return calls seeking comment. Under the state's voter identification law, residents must present an acceptable form of photo identification for their vote to be counted. 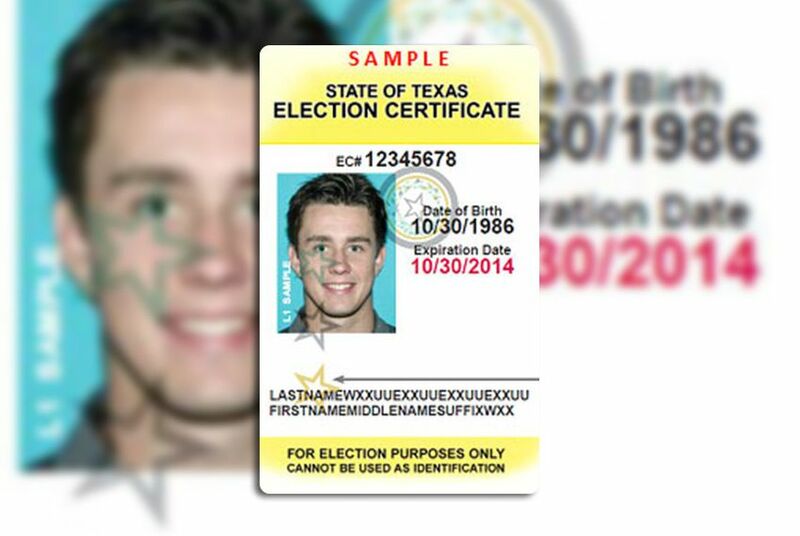 Acceptable photo IDs include Texas driver’s licenses or Texas ID cards that have not expired more than 60 days at the time of voting, U.S. passports, or military or U.S. citizenship certificates with photos. Texas residents who do not have those forms of identification can obtain election identification certificates, or EICs, from the Texas Department of Public Safety by presenting documentation — such as a birth certificate — that proves U.S. citizenship and identity. They must also have a valid voter registration card. So far, only 279 EICs have been issued. A federal trial over the state's voter ID law, now underway in Corpus Christi, claims that as many as 787,000 people in Texas are eligible to vote but not to be counted because they do not have proper photo IDs. DPS spokesman Tom Vinger says that more than 1,700 people have inquired about the new EIC, but added that most of those inquiring were able to locate acceptable photo IDs and did not apply for the new document. The Senate Democratic Caucus, concerned that the DPS mobile units are not accessible enough for those who do need EICs, are asking the secretary of state's office, which oversees voter registration and the scheduling of the mobile DPS units, to offer more hours for those in need of this new identification card. The senators asked Berry to "provide mobile ID stations in each of the major metropolitan areas (Austin, Corpus Christi, Dallas, El Paso, Fort Worth, Houston, McAllen and San Antonio) and for at least seven days, including at least two weekend days, between now and Election Day." The senators also asked for mobile ID stations in rural communities to be available for at least seven days, including two weekend days between now and Election Day. "We look forward to working with you and your staff during the coming months on improving access to EICs and during the legislative session on increasing the number of registered voters in Texas," the letter stated.